Trick-or-treaters could ring your doorbell more times on Halloween night than everyone else does the entire rest of the year. How do you cope with the constant visitors if you live with social anxiety disorder (SAD)? Strategies range from not participating to becoming the best-dressed house on the block. 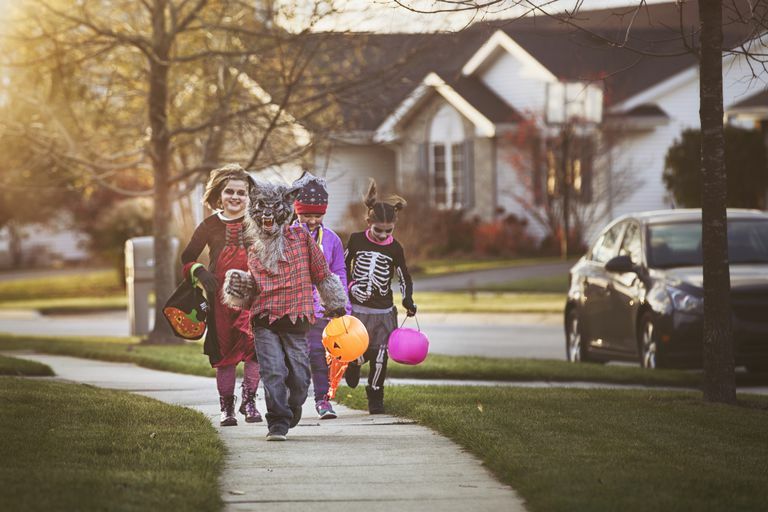 Below are some tips to help you cope with the anxiety created by trick-or-treaters at your door—ranked by the level of your social anxiety. If your social anxiety is severe, consider making plans to be away for the night. Lock all doors and turn off the lights to signal that you are not participating. However, be forewarned that you may come home to toilet paper in your trees anyway. If you are feeling brave but just don't want to face trick-or-treaters, make plans to go to a Halloween party to challenge your anxiety. If you don't want to hand out candy but do want to stay home, simply turn off the lights so that you won't be bothered. Since you will be sitting in the dark, it might be a good night to watch a movie on Netflix. Hand out candy only during a certain period. Most of the youngest (and cutest) children will visit between 6 and 8 pm—so plan accordingly. Pretend to be someone else. In the true spirit of Halloween, dress up in a costume that disguises your identity and gives trick-or-treaters something to notice other than your anxiety. If you are feeling especially anxious, choose a costume that includes a mask to cover your face. Take turns answering the door if there are others in your household, to help alleviate overload and give everyone a break. Either choose specific time slots or alternate answering the door; whatever works best. If you find yourself becoming overwhelmed by anxiety, others can simply take over Halloween duties for the night. Be the best-dressed house on the block! Carve lots of pumpkins, string orange lights, set up a tombstone on your front lawn, and hang ghosts from your trees. Your home will be a hit with the neighborhood kids and the decorations will give you potential conversation topics to break the ice with parents. Remember that Halloween night can be a perfect time to get to know parents and children in your neighborhood. Whether you have lived on the same street for 10 years or just moved in, it is a chance for you and your neighbors to learn more about each other. If you turned off the lights last year, aim to hand out candy for one hour this year. If you handed out candy for one hour last year, aim for two this year. If you avoided talking to trick-or-treaters last year, aim to have conversations with parents and children this year. What if it's your child and not you who is anxious about Halloween? This holiday is a mixed bag of scary things that can be frightening on their own, so it can be hard to decipher what is social anxiety versus just plain fear. If your child does not want to participate, don't force the issue. You might find that things change with time. Find alternative ways to celebrate that don't cause your child stress—remember, it's just one day of the year! Remember, this is the one night of the year that you can pretend to be someone else. Take advantage of that fact, and try on an anxiety-free persona. You might be surprised as it starts to feel more natural by the end of the evening. However, if you are living with severe anxiety that prevents you from enjoying any part of this night, considering making an appointment with your doctor to discuss diagnosis and treatment options for your social anxiety. Harvard Women's Health Watch. A holiday advisory for your emotions. Anxiety and Depression Association of America. Find your holiday happiness: Manage anxiety and depression. Martin SM, Quirk SW. Social anxiety and the accuracy of predicted affect. Cogn Emot. 2015;29(1):51–63. Mass Public Health Blog. The holidays can be hard: Ideas that can help. Woods L. Coping through holiday season anxiety.